The bathroom is often one of the smallest rooms in your home but it doesn’t mean that you won’t be able to create a space that looks good and remains practical. 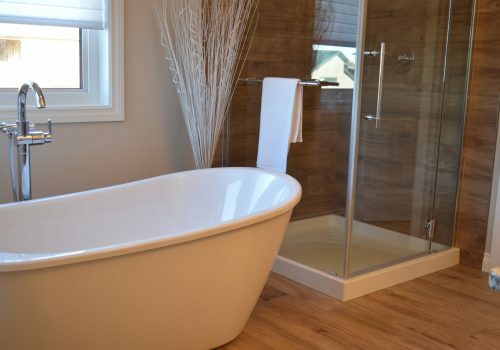 If you’re longing for a bath, but don’t think that you can fit one into the space you have available, then keep reading. In the latest blog post from EGP Plumbers, we take a look at top tips for making the most of your bathroom space. The placement of the goods in your bathroom is extremely important. A poorly placed sink or bath may mean that you have to sacrifice other items. To make the most of the entire room, use corner furniture that will fit neatly into awkward spaces and not leave unused gaps. To create the illusion of more space, use wall hung fittings to store items, rather than floor cabinets. By incorporating such features you can keep the floor space free, giving yourself more room to move and keep the bathroom looking clutter free. To maximise the space in your bathroom, try to keep the toilet and sink on the same wall, leaving room for other fittings in other areas of the room. For small rooms, use the shortest wall to place the shower on and leave the longer walls for the bath. Placement is just one important aspect to consider to maximise the space in your bathroom. A top tip is to change your bathroom door to a sliding or outwards swinging door. The result of this will be that you don’t have to account for the room of the door and can play around with a wider variety bathroom features to create your desired look. Here at EGP Plumbers, we have been creating bespoke bathroom designs for many years. Our highly experienced team of bathroom fitters specialise creating bathrooms of all kinds from the contemporary to the traditional. If you would like to speak to a member of our professional team, we welcome you to contact us today. Please call 0116 264 5115. Alternatively, head over to our online enquiry form and we’ll get back to you shortly.